Oh my pebbles…… what have I gotten myself into? I’m 6 bobbins in and not quite half-way done!!! I must admit I’m having fun though. I’ve finally stepped away from my walking foot!! WaHoo . . . Looking good, keep going! It’s always hard for me to get up my FMQ mojo but once I start it’s never so bad as it seems as long as my tension behaves. This will be fantastic! Totally worth it! It looks great! I love that look, but haven’t tried it yet. Good for you! Aren’t they fun? 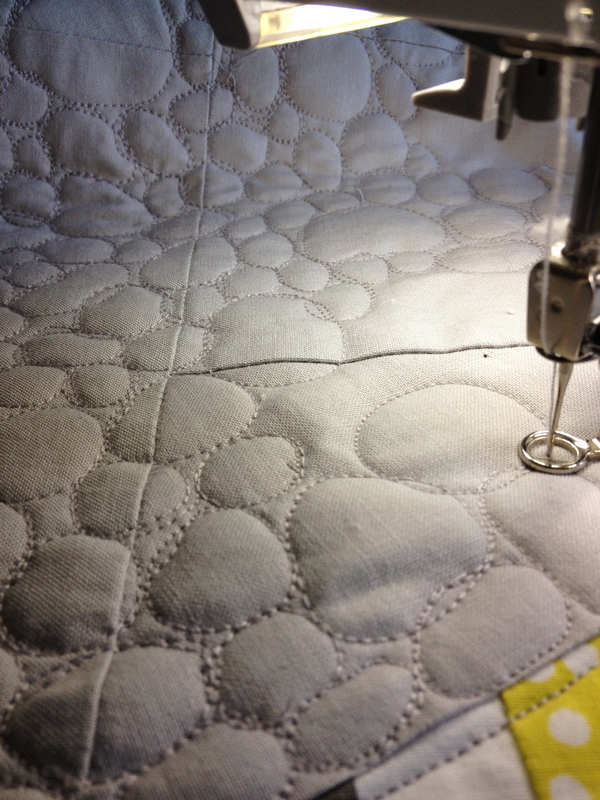 I love the pebble quilting, I think that’s what it’s called at least : ) Yours looks great! looks great! i’m trying to work up the courage to try this on my latest quilt.